Mind the horn, originally uploaded by lightwriter27. On Guard!, originally uploaded by lightwriter27. During a recent trip to the United Kingdom, I spent a lot of time in museums. 28 museums total, and after a while I started to get bored and was needing some sort of fun photographic opportunity. I came across this rhino on display in the Theatre section of the V&A Museum in London that was used as a prop in some play. 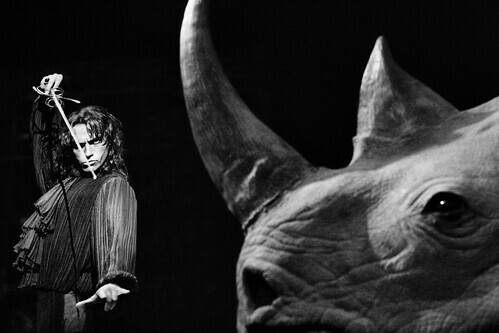 Behind this rhino, images of various actors in plays and ballets were projected on the wall. 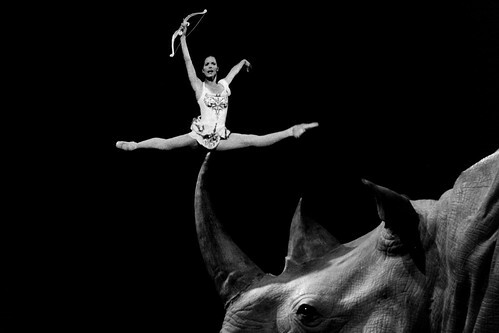 I spent a good 30 minutes by this rhino, trying to get many different and fun combination and these two were my favorite from my attempts. oh, i love the first one! it's so funny. i also dig the corn dog kid below. 15 pres for that – bam!